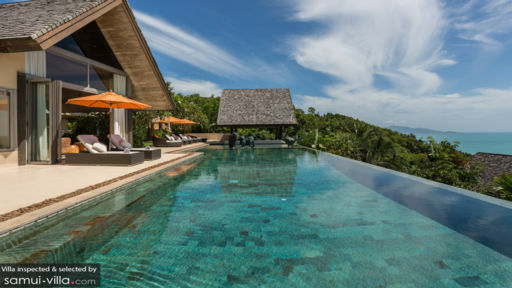 As one of the five residences in the exclusive and luxurious Panacea retreat in Koh Samui, Purana Residence is an equally beautiful 4-bedroom villa overlooking the coastal region of Bophut and the Fisherman’s village. 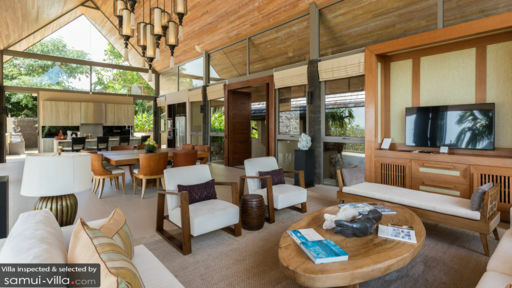 With unparalleled panoramic views of Koh Phangan, Plai Laem, and the Big Buddha, Purana Residence is the ideal holiday destination for family and friends. Spend your time being pampered to your heart’s content at Purana Residence with the most attentive staff and complementary services! There are 4 bedrooms in Purana Residence which provide direct access to the infinity pool outside. Each room is furnished with a king or a twin bed and has a modern, well-equipped en-suite bathroom. There is no compromise on luxury at the villa with the best facilities and services. Outside one of the rooms are sunbeds where guests can take their afternoon siesta right beside the pool. Have a barbecued dinner right outside your bedroom without having to travel long distances into the town! On the first level of the villa is the 20m long infinity-edge swimming pool lined with comfortable sun loungers and chairs. 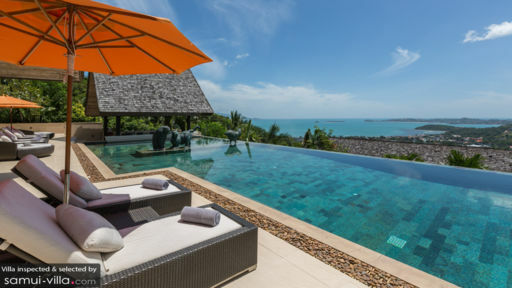 The pool boasts of a panoramic view of all the neighbouring areas of Samui towering over them beautifully. Watch the sun go down without having to leave the premises right from the comfort of your room. Besides the pool is an open-concept Sala or dining area, which can guests can use for dinner amidst a natural and refreshing setting. The sala comes with a barbecue facility perfect for an evening party with friends and family. The living and dining area is located on the upper deck right above the bedrooms and pool area. The open-plan space is like a glass room which has sunlight flooding in from all directions and a breezy, calming atmosphere perfect for spending a day indoors. The living space has comfortable sofas and chairs and it is decorated in a lavish modern template. The fully-equipped modern kitchen also features bar stools for additional seating. The dining table can accommodate enough people for everyone to have a comfortable and wholesome time! With high wooden and glass ceilings and glass walls, this is a beautiful space you wouldn’t want to pass up on. The friendly and accommodating staff at Purana Residence is at your service at all times. If you require any assistance to make your stay easier, don’t hesitate to approach the concierge or other staff members. There is regular daily breakfast facilities for the guests and if you wish to visit the nearby areas, the staff can assist you to make arrangements. You can go for activities such as scuba diving, hiking, island sightseeing, and sailing trips around the villa. Also, guests can visit the nearby Chaweng Beach which is the main tourist spot in Samui.